Bradley Manning has been sentenced to 35 years in prison for crimes related to stealing government documents and sharing them with WikiLeaks. The sentence, handed down by Judge Denise Lind, is significantly less than the 60 years that the government asked the Army colonel to hand down. The judge did send the young soldier through the gauntlet a little bit. After his rank is to private E1, Manning will be dishonorably discharged from the military and will also forfeit all pay and allowances. Manning is, however, eligible for parole after serving one third of his sentence. As he left the courtroom, supporters shouted, "We'll keep fighting for you, Bradley." 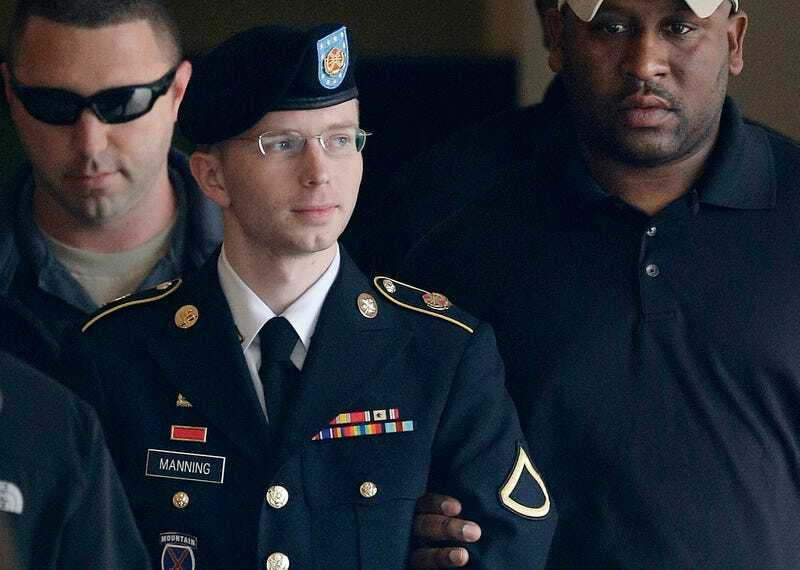 A month ago, it seemed entirely likely that Manning would be sentenced to life behind bars. In addition to the charges for which he was later convicted, the 25-year-old Army private was charged with aiding the enemy, a serious charge that carries the life sentence, but was not ultimately convicted. The bulk of the charges for which Manning was convicted were related to violations of the Espionage Act and stealing United States government property. The judge did give him 112 days of credit for his mistreatment at the Marine Corps brig in Quantico, Virginia, giving him a total of 1,294 days of credit including the time he's already spent in detention. When all's said and done, the most relevant part of Manning's conviction and sentencing centers around how severely he was treated by the government. It wasn't just the abuse while in prison; it was also the mere fact that he spent hundreds of days being detained by the military without receiving a trial. For actions that some people say make him a hero, the young intelligence analyst will now spend decades in prison. But does his sacrifice matter in the end? History will be the judge of that.